Carry your imaginBank cards in the Wallet app and shop wherever you like knowing that you can pay easily, securely and privately. So, how do I add my imaginBank cards? Tap the “+” in the corner. On Apple Watch or iPad if you're asked to add the card that you use with iTunes, just enter its security code. Or tap ‘Add another Card’ and enter the card information with the camera. To add a card on Apple Watch, open the Apple Watch app on your iPhone. To add the card on your iPad, go to Settings. Tap Wallet and Apple Pay and select Add Credit or Debit Card. If you're asked to add the card that you use with iTunes, just enter its security code. Or tap ‘Add another Card’ and enter the card information with the camera. To pay in stores, place the iPhone next to the reader and put your finger on the Touch ID sensor. On your Apple Watch, tap the side button twice and place the screen next to the reader. 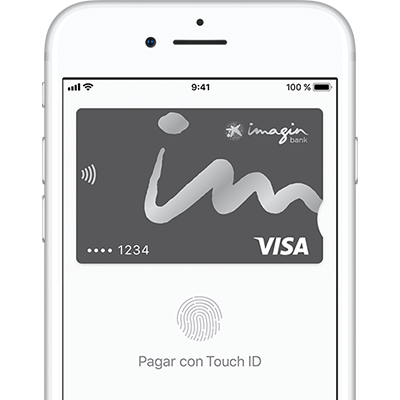 To pay from an app or by Internet on your iPhone or iPad, select Apple Pay as payment method and place your finger on the Touch ID sensor. 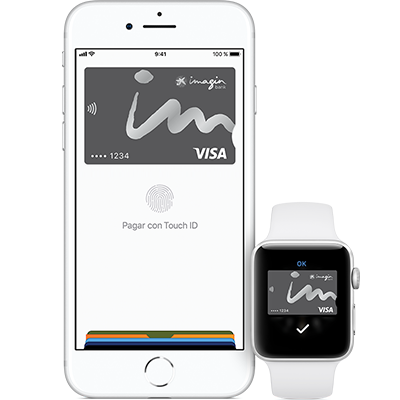 If you are using Safari on a Mac, select Apple Pay and then complete the purchase from your iPhone or Apple Watch.